Say hello to my new obsession! This band has been one I've had my eye on for a while and as soon as the album came out I was hooked. 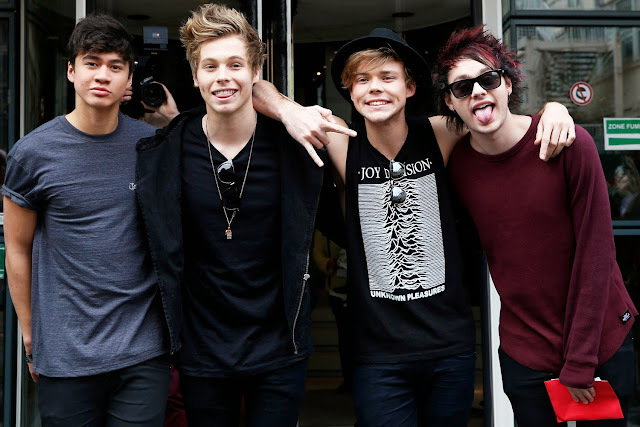 5 Seconds of Summer is a pop punk/pop rock band from Australia. The band consists of four members, Ashton Irwin, Luke Hemmings, Calum Hood and Michael Clifford, all of which are amazingly talented and adorable. Their first album '5 Seconds of Summer' was released on June 27 in Europe and I've had it constantly on replay since. The songs are very upbeat and features a lot of guitar and catchy tunes. The guitar in the songs isn't heavy and they are mainly pop with catchy lyrics based on life as a teenager. The lyrics aren't very deep and meaningful but are very easy to sing along to. I really like the songs as a few were co-written by Alex Gaskarth, a member of my favourite band, All Time Low who are also a pop punk band. My favourite songs on the album are 'Voodoo Doll', 'Amnesia' and 'Good Girls.' 'Voodoo Doll' and 'Good Girls' are quite rocky with good catchy choruses and a good beat to them, I literally can't stop myself from singing along or breaking into a slight dance when I hear them. 'Ammesia' is the slowest and most heartfelt song on the album about remembering a past relationship and wishing you could 'wake up with amnesia' and forget it all. It's a very relatable song for me and sometimes it makes me want to cry but I love it a lot. Other songs on the album are the songs that have been released like 'She Looks So Perfect' and 'Don't Stop' which I hear on the radio all the time and have proven to be popular. They are touring next year with their 'Rock Out With Your Socks Out' tour and I cannot wait to see them live! I am expecting even bigger things for this band and if you haven't listened to them, what are you waiting for?